This PlotOfLand, with Panoramic View, with a plot of 9000 m². Plot of Land near Felanitx, with Panoramic View to the Sant Salvador and a plot of approx. 11.000 m². Studio Apartment, Cental situated, with Ocean View, 1 bed- livingoom, 1 bathrooms, a useable area of approx. 35 m². Ground Floor Studio Apartment, Close To The Beach situated, 1 bathroom, a useable area of approx. 29 m². Plot of Land, Village situated, with a plot of approx. 222 m². This Ground Floor Apartment is inj the Village of Calonge situated, has Ocean View, 1 bedroom(s), 1 bathroom(s), a useable area of 43 m², a terrace of 5,7 m², garden with13m² and garage. Town house cental in Felanitx situated, with Village Skyline View from the roof terrace, 2 bedrooms (3 bedrooms possible), 2 bathrooms, a useable area of approx. 176 m², with a plot of 82 m². House in Felanitx, Cental situated, with Village Skyline View, 4 bedrooms, 1 bathroom, a useable area of aprox. 190 m², with a plot of aprox. 260 m². "for renovation". Plot of land close to Felanitx, Quiet Place situated, with Panoramic View, with a plot of approx. 20000 m². Electricity is preinstalled!! 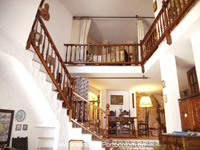 Finca between Felanitx and Manacor, Cental situated, with Panoramic View, 2 bedrooms, 1 bathroom, a useable area of approx. 75 m², with a plot of approx. 7000 m². This PlotOfLand, Quiet Place situated, with Panoramic View, a useable area of 19000 m². This PlotOfLand with a smal casita in Portocolom, Cental situated. House in Felanitx, Cental situated, with Village Skyline View, renovated in 1990, 3 bedrooms, 2 bathrooms, a useable area of approx. 110 m², with a plot of approx. 400 m². Terraces, Patio and small garden. This PlotOfLand, Village situated, with a plot of 400 m². Building Plot, property in Portocolom , Cental situated, 413 m².